NEW YORK (CNS) — “Timbuktu” (Cohen Media Group) offers one of the most gently lyrical and original portrayals of withstanding tyranny ever shown. The oppression comes at the hands of jihadists who occupied northern Mali, imposing sharia law based on a fundamentalist reading of the Quran. They’ve banned music and soccer. Bullhorn-wielding “enforcers” with pickup trucks and motorcycles harass and arrest violators. Director Abderrahmane Sissako’s camera lingers on a group of young men, warmed by the midday sun, defiantly and joyfully playing soccer. Or so it seems. There’s no ball. They’re just pantomiming a game, getting full enjoyment out of it as they jostle in formations and celebrate “goals.” When the enforcers drive past, the players mutely perform calisthenics. Most of “Timbuktu,” an Academy Award nominee for Best Foreign Language Film, is based on events occurring in early 2012. That’s when ethnic Tuareg rebels, assisted by the Islamist group Ansar Eddine, known to be linked to al-Qaida, overran parts of Mali, a landlocked nation in western Africa. Their goal was to establish a separate state. The French military expelled the jihadists the following year. Catholics comprise less than 2 percent of Mali’s predominantly Muslim population of 15.3 million. Archbishop Jean Zerbo of Bamako and Catholic Relief Services delivered humanitarian aid for displaced persons in the aftermath of the military action. The director forgoes awkward political debates to show the occupation’s impact on a tent-dwelling herdsman, Kidane (Ibrahim Ahmed). Kidane is devoted to his wife, Satima (Toulou Kiki), his 12-year-old daughter, Toya (Layla Walet Mohamed), and to Issan (Mehdi A.G. Mohamed), an orphaned boy the family has taken under its wing. Mali has a long tradition of tolerance. So at first, the locals resist their young occupiers with simple refusals. A half-dozen jihadists storm into a quiet mosque during prayers. The imam (Adel Mahmoud Cherif) reminds them they can’t enter a mosque wearing shoes and toting guns. The imam is unimpressed: “Please leave.” So they do. Another jihadist insists that Satima must keep her hair covered. “If he dislikes it, he shouldn’t look at it,” she retorts. An angry fishmonger in a market dares the men to cut off her hands for not wearing gloves while she works. They back away. The true horror arrives after Kidane is arrested and sentenced to death for slaying a fisherman who killed one of his cattle. A couple whose only crime was having relations out of wedlock are buried in the sand up to their necks and stoned. Young girls are forced into marriages. Fatou (Fatoumata Diawara), a singer, croons softly in protest, without screaming in pain, as she receives 40 lashes for the crime of making music. How does Sissako think his measured presentation can counterbalance such desperate acts as the Charlie Hebdo slaughter in Paris and murders by Islamic State fighters in the Middle East? Is it also, in any way, an expression of his personal religious faith? The question, one so blithely asked by Americans these days, takes him aback: “I find that to be a somewhat delicate question — because I think faith is a personal matter. 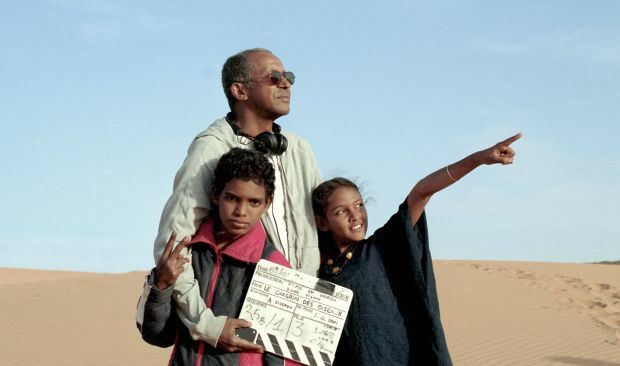 To bring it up to other people, personally, it disturbs me,” Sissako replied. “What interests me is a person’s ability to defend human values. These values belong to every religion.